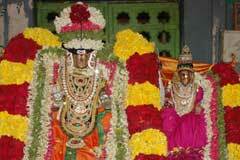 The temple is praised in the Thevaram hymns of Sundarar. Addressing the Lord “Pasupada Paranchudar” having His home in Tirumullaivayil, surrounded by fragrant gardens, Sundarar, in his hymn, says that Lord Shiva’s Lotus Feet are his wealth and wisdom and he does not care for men of material thinking. He seeks Lord’s grace for relief from certain problems he was facing then. 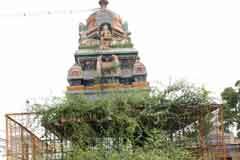 This is the 22nd temple in Thondai Nadu region (places covering Chennai, and adjoining areas as Kancheepuram, Chinglepet etc.) praised in Thevaram hymns. 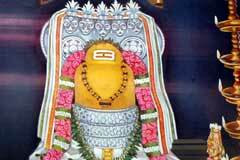 Vaikasi Brahmmotsavam in May-June, Masi Float Festival in February-March and Aani Vasantha Utsav in June-July are the festivals celebrated in the temple. 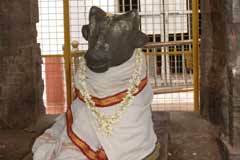 There is a scar on the head of the Swayambulinga in the temple. As if to heal the wound, sandal paste is applied on the Linga throughout the year except two days in the month of Chithirai (April-May) covering the Sadayam star day. Lord appears in His true form these days. 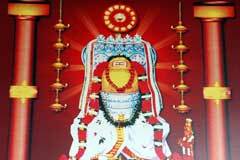 Worshipping Lord Shiva in this form during these days would relieve the devotee of all sins, it is firmly believed. 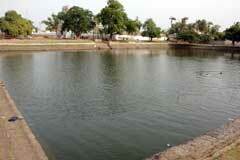 As no abishek is performed to the Linga, A Padarasa Linga (Mercury Linga) is placed in a separate shrine for Pujas. The Vimana (tower above the sanctum sanctorum) is of Gajabrushta – back side of an elephant – design. 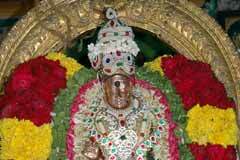 The temple is open from 6.30 a.m. to 12.00 a.m. and from 4.00 a.m. to 8.00 p.m.
Sri Masilamani Easwarar Temple, North Tirumullaivayil, Chennai. Devotees offer Sandal paste Alankara to the Lord on realizing their wishes. 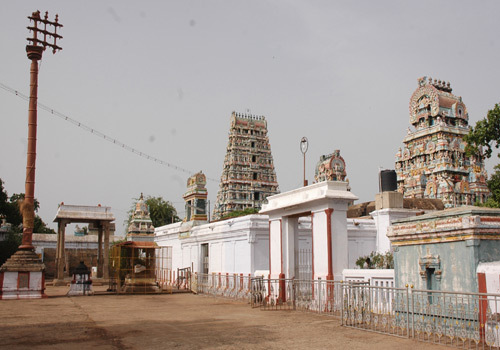 There are shrines for Cholapureeswarar, Kuchalapureeswar worshipped by Lava and Kucha, sons of Lord Sri Rama) and Lord Muruga with His consorts Valli and Deivanai in the corridor-prakara. Having done wrong to Lord Shiva, the king attempted to end himself. In His hurry to protect the king, Lord Shiva appeared before him without even inviting Ambica with him and said that despite the injury, He would be all graceful to all. Ambica joined the Lord Later and now has Her shrine right of the Lord. Lord Shiva sent Nandhi along with the king’s army to defeat the demons. 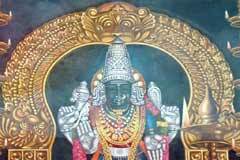 He brought two pillars made of Vellrukku tree, placed them in the temple he built then. These two pillars are in the temple even today.